Directed by Lucy Craft, Karen Kasmauski, and Kathryn Tolbert. USA. 2016. 26 min. 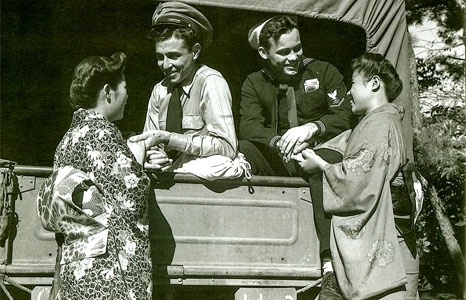 Despite lingering wartime enmity, tens of thousands of Japanese wives—the biggest influx of Asian women in U.S. history—crossed the Pacific following World War II. They began new lives in difficult and, to them, mysterious circumstances, scattered across the country in places where people had never seen a Japanese person before. What was it like to abandon family, friends and country, and marry a former enemy? Even for those whose choice of spouse proved to be a tragic mistake, there was no turning back. Many in Japan viewed them as social outcasts and even today the Japanese term for “war bride” is highly stigmatized, inferring they were bar girls, even prostitutes. Now these women are in their 80s. Fall Seven Times profiles three women whose lives were shaped by one irrevocable decision. Directed by Christopher Makoto Yogi. USA. 2013. 13 min. Japanese with English subtitles. Living out his last days in O‘ahu’s North Shore, an old Japanese man is visited by the ghosts of his past. • Oct 2, 4pm: Join us for a post-screening Q+A with director Lucy Craft and Marlene Blackwell. • Oct 4, 1pm: We will be joined by producer Megumi Nishikura (via Skype) and Marlene Blackwell for a post-screening discussion. • Oct 4, 7:30pm: Marlene Blackwell will lead a post-screening discussion. Marlene Blackwell is the daughter of Sally Sachiko Blackwell. Sachiko was a Japanese war bride who married her soldier husband at the American Consulate in Fukuoka, Japan and moved to Lancaster, South Carolina in 1952. Marlene was instrumental in introducing this film to O‘ahu through her contact with Kathryn Tolbert, one of the film's directors.